Last weekend I watched a Hindi movie, Hichki, starring Rani Mukherjee. It is a comeback movie of Rani Mukherjee after her maternity gap and promo looked promising, so I thought of giving it a try. The word “Hichki” in English means hiccup and the movie brilliantly portrays the hiccups in the life of Naina Mathur (reel name of Rani Mukherjee). In this movie, Naina is portrayed as a girl suffering from Tourette syndrome, a neuropsychiatric disorder that results in multiple motor tics and her battle to win all life hiccups to lead with pride. Resilience and perseverance lead to success – The life of Naina is a classic example of sheer resilience and perseverance. Her defeats in all the interviews, her lows during childhood, her agony while handling school students, her difficult times with family and yet smile in her face is a true example of her dedication and spirit. I remember a dialogue from the movie when she mentioned that she is rejected by 18 schools for the job and 12 schools as a student. Yet, the positivity around her shows her strength of bouncing back and combating the battle! No students are bad, only teachers are bad – Naina gets the opportunity to live her dream and teach students at St. Notker’s, but with a clause! She has to teach students of class 9F who are ex-students of municipal school and come from slum areas. Handling 14 students was a daunting challenge for Naina. But when she starts teaching, she realizes that students can’t be bad. It is the responsibility of the teachers to groom them. This can be correlated to the real-life market situation as well, where students can be mapped with customers and teachers as organizations. In this fast-paced life, customers’ needs are changing and it is the responsibility of the organizations to cater to their needs. Hence, no customers are wrong; only organizations can be wrong! “Overcome the fear within you” to win the world – The movie very nicely explains the importance of overcoming the fear within you. Naina asks all the students to write their fear on last page of the notebook and instructs them to make a paper plane. Once made, they are encouraged to fly the paper plane and witness the fear flying in the air! In our real life also, it is very important to overcome our fear to reach the pinnacle. Fear is one element which grasps us from within and stops us to try something new! It is very important to overcome our fear to reach the pinnacle. Fear is one element which grasps us from within and stops us to try something new. Inclusion is the new Success Mantra – Hichki also touches the element of Right to Education and including the students from a nearby slum area in a prestigious school like St. Notker’s. In our corporate world too, it is very important for organizations to encourage inclusion in the way they work. This means inclusion, not in Gender, but inclusion in thinking, inclusion in behavior and inclusion in culture. Diversity and inclusion help in bringing different perspectives together and in turn, in yielding better results. Learning should be FUN – In the movie Hichki, Naina adopts a unique way of teaching through fun. She realizes that only theory won’t yield good results and a blend of fun and theory might yield better results. And she was right! Realize your hidden strengths – Naina as a teacher made all the students realize the real strength of themselves. She uses a game like a scenario to highlight the excellent mathematics and calculation skills of one of the students. And she does the same with other students as well! In the corporate world also, as in the film, it is very important that we understand our core strength (also known as core competency) and work around that. Many times, the role of Naina is played by the customers, if we are open to suggestions and feedback. Collaboration can generate better results – The movie ended in a dramatic way where the science project created by 9A blasts and all the dreams gets shattered in seconds. But, it does not stop there. 9A and 9F realize that if they work together, they can use each other’s competencies and make a science project afresh. And they did the same! The final project created in collaboration with 9A and 9F turns out to be much better and innovative. Speak the language of students- Naina portrays the role of a true salesman who understands the needs of the target segment and molds her teaching style according to them. She realizes that teaching pattern used for 9A won’t work for 9F, as they are a different breed altogether. Keeping this in mind, she speaks the language of 9F and wins the trust of students. Similarly, it is important for organizations also to win trust through understanding the needs of the customers and catering to them! Motivation sometimes is more helpful than Sympathy– Movie revolves around a disorder called Tourette syndrome which makes the life of Naina miserable. But, Naina and her mother never wanted to accept it as a syndrome and wanted to be treated as a normal child. This gets transferred when Mr. Khan, ex-principle of St. Notker’s, accepts Naina as a normal student and motivates her for life! Many a time, people with some disorders need internal motivation than mere sympathy. Always encourage healthy competition– Hichki is also a movie of a tussle between the class teachers of 9A and 9F. The actions of a class teacher of 9A (played by Neeraj Kabi) sometimes move to a direction which crosses the lines of healthy competition. This, in turn, results in negative energy within students of 9A and hatred against 9F. In our real life as well, it is very important for us to draw a line between healthy and harmful competition. In this competitive world, many a times companies cross the lines and start gaining money through evil means. Always remember, you reap what you sow! Set your target high. 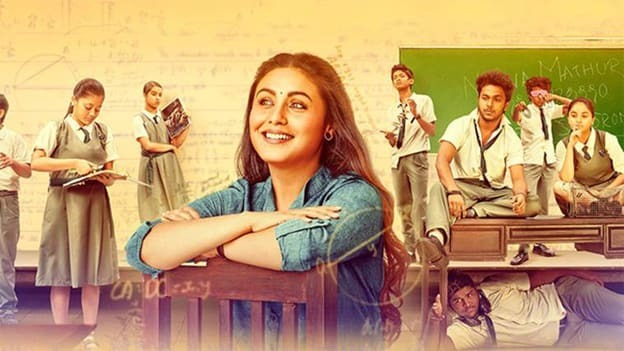 It helps in achieving it – In the movie Hichki, Naina Mathur sets a goal for herself in front of the Principal, that someone from 9F will also get Prefect badge after the coming exam results. It was a difficult task knowing the students she had to deal with. But, she took it as a challenge and won it through her hard work and dedication. Two of the students from 9F got more than 90% in final exams and received Prefect badges from Naina herself. In real life also, we should have goals for our life. They should be challenging so that we strive hard and push ourselves to achieve them. Pour in with your views and feedback….Let the ideas flow!